JW Winco, Inc., A Ganter Company, a leading supplier of standard industrial machine components, now offers an assortment of GN 1400 series Steel Telescopic Slides with full, partial, and double-sided full extensions. With a wide range of extension types and additional functions and dimensions, these RoHS compliant slides can handle loads of between 50 and 700 pounds (220 and 3100 N) of force per pair. The 13 new variations, which feature telescopic rails made of rolled sheet metal, are suitable for use in a number of different applications. Depending on the length of the extension, the steel telescopic slides are made up of two or three interconnected slides. 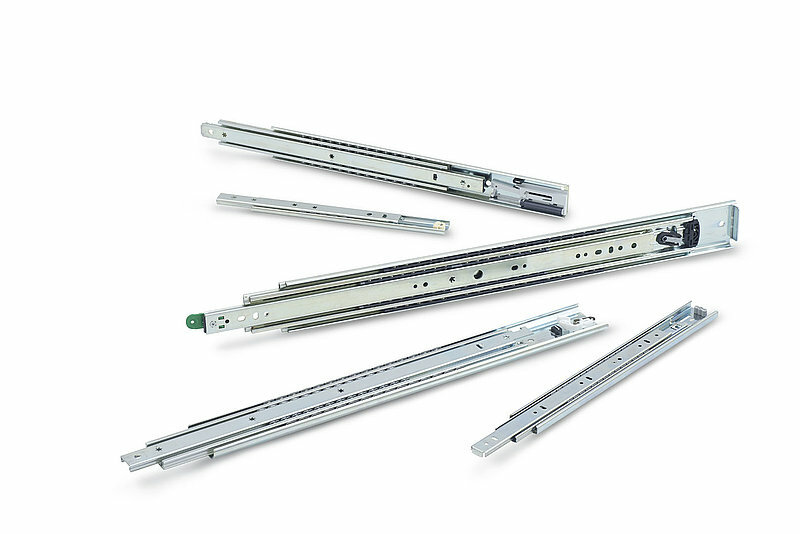 Winco’s product range includes a wide scope of solutions in terms of features, including latches and dampening systems. The slide profile is steel, zinc plated, with a blue passivated finish. The bearings are steel and hardened, while the ball cage outer slide is either steel with a zinc plated finish or plastic, with a steel, zinc plated inner slide. The rubber stops on select versions are plastic/elastomer, while the self-retracting mechanism is stainless steel and plastic. The telescopic slides function in operating temperatures from -4 °F to 212 °F (-20 °C to 100 °C).